The claims made by the White House are disingenuous (at best) because they ignore the median U.S. household and focus instead on the increase in overall wealth, which has largely come from gains in the stock market. The White House is essentially saying that we shouldn’t worry about the plight of the typical family because Warren Buffett’s stock holdings have gone up in value by tens of billions of dollars since March 2009. The focus on aggregate household net worth is extremely comical when compared to previous statements made by the President and others in his Administration about the country’s lamentable concentration of wealth and income in the hands of a “fortunate few.” Someone should ask President Obama if this means we needn’t worry about income disparities anymore because total household income is up nearly 20% on an inflation-adjusted basis over the past 10 years? There is a second reason while the bang of the fiscal package will likely lag behind the bucks. Even if the global financial system soon restores some semblance of order and function, the collapse in global equity and housing market values has so impaired household wealth that private consumption (which represents 60% to 70% of GDP in G7 countries) is likely to lag – not lead – economic growth for some time, as households rebuild their balance sheets the old-fashioned way – by boosting their saving rates. The current recession has resulted in an unprecedented collapse in net wealth. In other words, it is a deep “balance sheet”‖recession. But with personal wealth diminished and private credit impaired, some economists believe that stimulus is likely to be less effective than it would be in a different type of recession. This is because consumers are likely to use their stimulus money to rebuild their nest eggs, i.e., to pay off debts and save, not to buy new products as Keynesian theoreticians want them to. The White House is interested in escaping blame for the collapse in median net wealth. That’s understandable; that’s what White Houses do. It is harder to escape from the policy implications of a balance sheet recession. This entry was posted in Stimulus and tagged Columbia University, consumption, Federal Reserve, GDP, growth, President Obama, Warren Buffett, White House, White Houses on June 15, 2012 by Matt Mitchell. Yesterday Vero testified before the House Ways and Means Committee. The topic was “Impediments to Job Creation.” The other witnesses were Stanford Professor Edward Lazear, AEI Resident Scholar Andrew Biggs, and Center for American Progress Senior Economist Heather Boushey. All of the witnesses, I thought, did an excellent job. But Vero was particularly good. Clinton stands alone among post-WWII presidents in presiding over a period in which federal spending as a share of the economy actually shrank (going from 21.4 percent in 1995 to 18.2 percent in 2001). Clinton negotiated and ushered through Congress the most-significant free trade agreement of my lifetime. Clinton signed welfare reform (perhaps reluctantly), signaling the only major retrenchment in the welfare state since LBJ (and that’s counting all 8 years of the Reagan presidency). Clinton signed the largest reduction in capital gains taxation in U.S. history. Arguably, the most-significant anti-market policy of the Clinton years was the 1993 marginal income tax hike. But just to put that in perspective, recall that this legislation raised the top marginal rate by 8.6 percentage points from 31 percent to 39.6 percent. Now recall that Reagan had lowered it over 40 percentage points from 70 percent (!) to 28 percent. On balance, it is hard to characterize the Clinton years as anything but a marginal improvement in economic freedom (indeed, that’s what the data show). Why, again, were Democrats so eager to remind us of the prosperity of the Clinton years? Spending as a share of GDP rose from 18.2 percent to 25 percent. The president pushed, and got, the first new entitlement—Medicare prescription drug benefits—in nearly half a century. The president imposed steel tariffs as high as 30 percent. 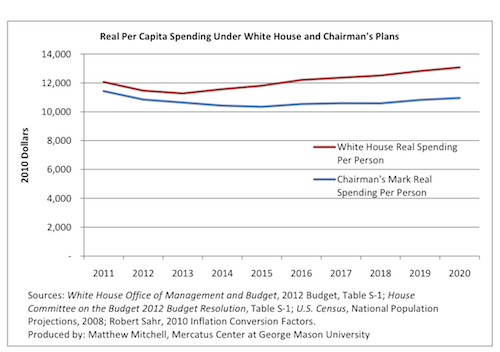 No fewer than FOUR countercyclical fiscal policy measures were undertaken: cash rebates in 2001, countercyclical investment incentives known as “bonus depreciation” in early 2002, tax rebates in 2003, and more rebates in the 2008 stimulus bill (it is seldom remembered that Obama’s 2009 stimulus bill was the second such bill during the Great Recession). Congress passed and the president signed a sweeping and wholly-unprecedented bailout of hundreds of financial firms (prompting the president to acknowledge that he had “abandoned free-market principles.”). Against this backdrop, politicians of both parties seem obsessed over the Bush tax cuts. Nevermind the fact that they were temporary, that they only reduced the top rate by 4.6 percentage points, and that they did not coincide with concomitant reductions in spending. Does that sound like a strikingly free-market record to you? Indeed, the data show that it is not. Why, again are Republicans so eager to remind us of the good-ol’ Bush years? This entry was posted in Tax and Budget and tagged Clinton Administration, economy, fiscal policy, FOUR, GDP, LBJ, percent, reform, spending, Stanford Professor Edward Lazear, tax, White House, WWII on March 31, 2011 by Matt Mitchell. Charity sector weakened by mergers and closings. Pressure to show jobs: White House releases latest stimulus report. Budget preview: No NASA trips to the moon til 2020. Ohio showdown over property taxes and school funding. This entry was posted in State Policy and tagged White House on February 1, 2010 by Eileen Norcross.